He plays piano with his feet? 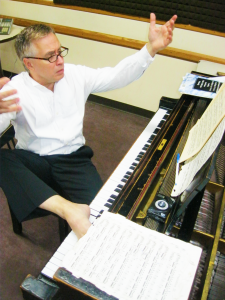 I play piano with my feet—to be consistent with our logo with my feet on the keys, I play a very short part of a Mozart Sonata with my feet. She bailed me out of tendinitus. I took scrupulous notes from Lucy and asked every question I could think of. She pain-staking brought me through the mechanics of playing. Which I understand perfectly well now. I recall her saying that a well-known music school in the mid-west brought her out there because half of the piano students and some of the faculty had an arm in a sling from tendonitis. I feel very fortunate to have had her tutelage. Without Lucy Greene, I would have never been able to continue playing.